Metallica may take awhile between albums and world tours, but when they do release music and hit the road, they make it well worth the wait. 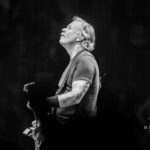 Such has been the case with their 10th album- Hardwired…To Self-Destruct and subsequent WorldWired World Tour, which kicked off in early 2016 and has stretched into 2019, recently hitting Indianapolis. This was the band’s first Indianapolis stop since September 2009, so the show sold out quickly and fans started showing up early in the day to make sure they had a good spot for the almighty Metallica and the show didn’t disappoint at all. Metal comedian Jim Breuer opened and emceed the evening, which was a perfect fit. He got the crowd amped up and ready to go before Metallica took over for a two-and-a-half hour set that balanced classic and new material perfectly. From the very start, the fans were rabid and demanded perfection from the band, which they got- and the band commanded nothing but the crowd’s full energy and adrenaline and they were more than ready to give it. They opened with “Hardwired” and “Atlas, Rise” before hitting the fans with “Seek & Destroy,” which was met with a deafening reaction and led to the crowd increasing the intensity. 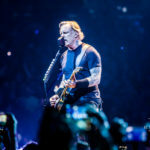 “The Unforgiven,” “For Whom the Bell Tolls” and “Sad But True” also saw insane levels of excitement from the crowd as well and “Fuel” brought in the pyro. At one point, the band also covered what many consider to be the best punk band to ever come from Indiana, The Zero Boys, and 2 of their songs “A Vicious Circle” and “Amphetamine Addiction”. The night was a special one, and had something for every generation and level of Metallica fan; for those who liked the classic and older material, they played “Ride the Lightning,” “Fight Fire with Fire” and “Creeping Death;” for the newer fans, they got “Moth Into Flame” and the aforementioned tracks. Then, of course for the Black Album fans, the show ended with arguably the biggest metal anthem in recent memory- Enter Sandman- as any Metallica show should end. 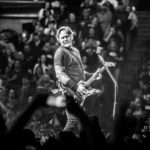 James Hetfield and the rest of the band made sure to convey their appreciation for the near-sold out house. “We mean this with all our hearts, Metallica is very happy to be alive, to be on this stage and that all of you are here too,” Hetfield said. He went on to talk about how the band has been going for 37 years and they haven’t taken it for granted that their fanbase has been so supportive for so long. “We don’t care who you are, what you wear, what you eat, what you don’t eat, what religion, what’s between your legs, who you voted for….we’re all family and everyone is welcome here,” Hetfield continued. Hetfield also pointed out a young fan in the front row- who was 11 years old and was there with his father, showing that the next generation of heavy metal was alive and well and was in the house in Indianapolis. Melting the faces off of Indiana’s most ie hard metal heads was not the only thing that the band accomplished while in Indiana. They also donated $10,000 to Gleaners Food Bank through the All Within My Hands Foundation.